Still on my lemon tart kick - mostly because I bought far too many lemons the first time around (am seriously looking into lemon chicken and whatever the heck else involves lemon right now...might even pickle some lemons or make some lemon curd - send recipes!) and I'm trying to still find the "best" lemon tart recipe. 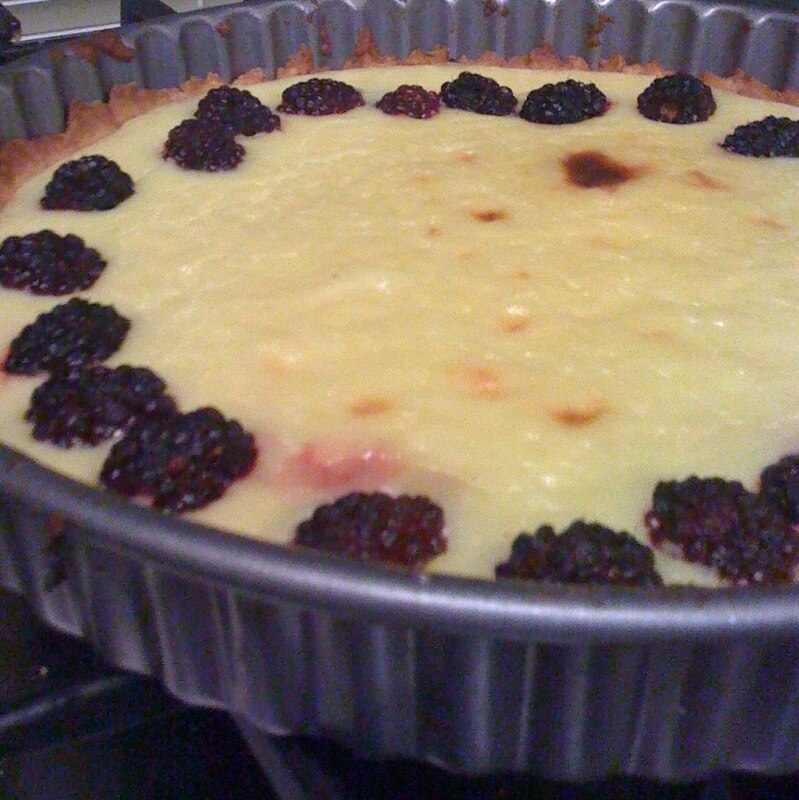 There are so many variations out there...some call for wine, others call for "brulee" with sugar on the top, others are custard poured in after the crust has set and aren't baked at all. I'm also enjoying playing with tart crust - I still had a mandarin orange left from last week's adventure, so I grated the zest right into the crust dough. Turned out lovely! Mix all the ingredients with fingertips in a bowl except for the zest. Push it around and get the butter really mixed in well with the dry ingredients until it becomes a grainy-like dough. Then add the zest and mix it with your hands again. Leave to chill at least 45 minutes in fridge. Butter spray the tart pan and spread the dough out - wait until it's room temperature, because it's a little testy with the zest. Pre-heat oven to 350 degrees F, bake for 20 minutes. Whisk sugar, eggs, yolks, lemon juice, wine and lemon zest in heavy saucepan over stove. Whisk until it begins to boil and gets a thicker texture - like custard. Take off the stove and add cream. Stir occasionally. Pour filling into finished tart crust. Decorate with blackberries. Pre-heat oven to 400 degrees F and bake for another 20 minutes. this was delicious. and i forgive you for not teaching how to comment. BFFs again! Gosh I love berries. I love all the flavours you use in these recipes. You are a domestic goddess.